Inspired by a fierce loyalty to the most traditional aspects of bluegrass and old-time mountain music, Ohio-based Dry Branch Fire Squad draws its audience into the ancient emotional resonances in which bluegrass is rooted, and provides a strong taste of the culture in which it evolved. DBFS founder, Ron Thomason, is joined by Dan Russell, Brian Aldridge, and Tom Boyd, combining traditional bluegrass and old-time tunes with wry humor and cultural commentary, concocting a performance that is alternatively soul stirring, politically edgy, and hilarious. Lauded for her musical intuition, muscular playing, and sweet singing, former Reeltime Traveler Heidi Clare was praised by Ron Thomason in a memorable passage: "She draws from a deep well of tradition. You can hear the licks and the tunes of the likes of Doc Roberts, Gid Tanner and their ilk come back to life here. 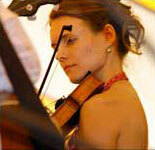 Heidi is a conduit for ancient fiddle spirits that are seemingly seeking modern outlets through her." She dances, too! Joined tonight by her band AtaGallop, featuring Eric Pearson (banjo), Ron Thomason (guitar), and Dan Russell (bass), Heidi is not to be missed! 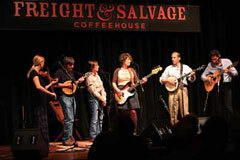 The Wronglers (Warren Hellman, Nate Levine, Bill Martin, Krista Martin, Colleen Browne, and Heidi Clare) made their stage debut at the world famous Hardly Strictly Bluegrass Festival in 2006, and quite literally had so much fun playing on stage that they just couldn't stop. 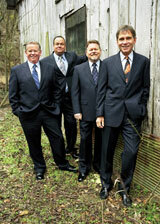 Their combined bluegrass, folk, and old-time techniques produce an intelligent, intimate sound with a generous abundance of twang.